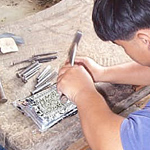 Thailand's jewelry artisans transform sterling silver into a lovely bracelet. The artisans weave the bracelet by hand and adorn it with medallions shaped like little hearts. 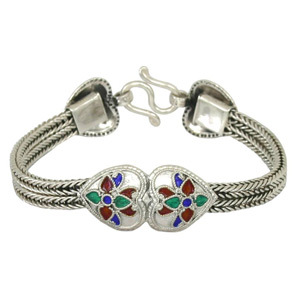 The hearts feature floral motifs colored with enamel. Fitted with a durable S-clasp for opening and closing, it makes a wonderful everyday accessory. Materials: Sterling silver (.925) and enamel.